I got sent down a path of nostalgic code review today. After spotting Wouldja Software’s RoboNuts, I couldn’t help but wonder if the source to my implementation of the same game from more than 10 years ago was still on my computer. I was beginning to think it was lost forever to some floppy disk backup at the bottom of some storage closet, but sure enough Spotlight found it! My coding conventions were still clearly suffering from UNIX culture. Yeah, the file is called “robotMvGfx.c” – short, I presume, for “Robot Movement and Graphics.” I’m sort of baffled by this design, but looking closer at the source file it might better be classified as “almost the whole darned app in one source file.” In addition to code for loading and plotting the graphics (icon resources), there is logic for all game movement, for reading and writing the high scores, and for double buffering the game display into a GWorld before flushing to screen periodically. 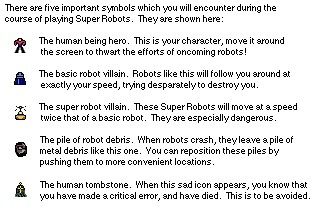 I remember shortly after releasing Super Robots, getting pretty instantly pummeled by dissatisfied users. I had neglected to properly check Gestalt for systems incompatible with APIs I was using. I hadn’t added much flair to the original UNIX game. I was a crappy artist. Etc., etc. I begged users to send me some money if they liked the game. I think two people sent me $5 each. Whatever. Two years later I was working on the Mac OS System File and having a grand old time. You don’t have to be perfect, or anything close to it, to be successful. Just be willing to learn from your mistakes and get better. This entry was posted to Apple, Nostalgia, Programming. Both comments and pings are currently closed. Thanks for reading! I had a similar experience looking back at a pac-man clone I wrote around ’94. Gah! It was nasty. I wrote a Risk Game from the late 80’s in TML Pascal (now those were fun days). I have the printout around and flip through it occasionally to keep myself humble.